The New York Yankees pulled off baseball’s biggest trade in almost 15 years on Monday, acquiring 2017 NL MVP Giancarlo Stanton from the Miami Marlins in exchange for Starlin Castro and two minor league prospects. The move has made quite a splash for two reasons. For one, the Yankees were not believed to be contestants in the Stanton Sweepstakes but took home the grand prize, and two, it is the biggest deal the MLB has seen since the Yankees brought Alex Rodriguez to the Big Apple in 2004. That move forever altered the baseball landscape and turned A-Rod into one of the most hated figures in sports history. Though it will likely not do the same for Stanton, no one can deny the magnitude of the trade, especially the Boston Red Sox. Boston was in the running for Stanton at one point, but that quickly changed. Dave Dombrowski’s payroll is high enough with David Price’s massive contract, and choosing to not add the most expensive deal in sports history to that was a wise move on his behalf. However, with their most hated rival making such a big addition to their lineup, Dombrowski and the Red Sox have to respond with a big signing of their own. Critics and fans alike underestimated the impact that David Ortiz’ retirement would have on Boston’s power. The Red Sox offense in 2016 led the MLB in batting average and smacked 208 home runs. Their first year without Ortiz since 2002 proved quite different. The team finished dead last in the AL with just 168 homers, a 21% decrease. Chris Sale and Drew Pomeranz’ dynamite pitching was enough to compensate, but the proof is in the pudding, Boston needs to stock back up on power. There are plenty of marquee names available that could easily fill that role. 3B Mike Moustakas, OF JD Martinez, C Jonathan Lucroy and 1B Eric Hosmer are just a few to name. 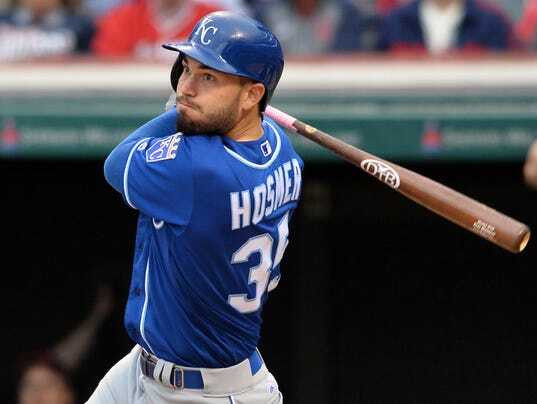 Hosmer appears to be the best candidate of the four given that Boston currently has an opening at first base with Mitch Moreland being a free agent, the team has yet to resign him. Moreland had a very good 2017 for Boston and was one of the team’s better players, but Red Sox fans would take an upgrade in Hosmer without thinking twice. Moustakas could also fit the role as a designated hitter if the team chooses to move Hanley Ramirez back to first, where he performed very well in 2016. Former Royals 1B Eric Hosmer would fit nicely in the Red Sox’ infield. Photo by USA Today. Lucroy and Martinez seem less likely. Christian Vazquez and Sandy Leon have solidified Boston’s shaky catching and neither are likely to be let go of. JD Martinez has been heralded as one of the top free agents this offseason, but his desire for a seven year contract in the $200 million range has scared many away from him and may be the reason that no team has made an offer yet. Whomever it may be, the Red Sox cannot afford to have a quiet offseason and need to bolster their team with another big bat that will take the pressure off Mookie Betts and Xander Bogaerts. If they do not, they will have a hard time keeping pace with the Yankees in 2018. The Boston Red Sox are bringing back catcher Sandy Leon. Boston has designated catcher Blake Swihart for assignment, according to WEEI.com’s Evan Drellich. According to MLB Network insider Jon Heyman, catcher Sandy Leon will be heading back to the Red Sox roster. Bird was placed on the injured list with a left plantar fascia tear, and Bird joins an alarmingly expanding injured list for the Yanks. In corresponding moves, the Yankees shifted Jacoby Ellsbury to the 6-day IL and selected the contract of first baseman Mike Ford, according to an official team announcement. Bird may done with the Yankees, as his career has been riddled by injuries and he has struggled at the plate this season. Cleveland Indians shortstop Francisco Lindor is set to being his rehab assignment with Triple-A Columbus, according to MLB.com’s Mandy Bell. Lindor is returning from a calf strain and a high left ankle sprain, which has kept him out of the start of the 2019 season. Lindor is one of baseball’s most promising young stars and is coming off an MVP caliber season in 2018.